Buy this Walmart Exclusive DVD for only $12.96. Thanks to Hulu Plus, my girls were introduced to a fun animated series, Pororo, about a little penguin and his friends. Both of my girls are crazy about penguins. From the first time they saw them at the aquarium a few years ago, they are now infatuated with all things penguins. From bedding to plush penguins clothes and even dishware, our house is all penguined out. :-) So, when I was recently browsing through the kids shows available for streaming through Hulu Plus, the girls quickly pointed out Pororo. At first, I thought not another penguin show. But, after watching the first episode, we were all hooked. The theme song is so catchy that I even find myself joining in when the girls are watching this show through Hulu Plus. So, when I heard that there was a new Pororo full length movie that was recently released from Lionsgate Home Entertainment, I just had to reach out and ask for a screener copy. I knew my girls would go crazy when they saw the DVD arrive in the mail -- and boy did they ever! They ran circles around the living and dining area, singing the Pororo theme song at the top of their lungs, before they stopped to take a breath and ask when we would be watching it. I had planned to save this DVD for the impending snow storm tomorrow, or even the weekend, but last night after being asked over and over again and reminded that Mommy has to review this DVD, my husband gave in and put the DVD on for the girls. While we had see this movie in the past, it was great to see it again, especially now that the Winter Olympics are on, and families are gathering around the television to watch events like bobsledding, ski jumping and more. Kids will go crazy for this new DVD release, as it has Pororo and his friends dreaming about becoming Jet Ski racer champions. Viewers will watch them train in order to be the best they can in hopes of achieving their dream of becoming a champion. But,it will take teamwork if they want to have a chance to win. Addition lessons taught in this full-length movie include the importance of telling the truth and why you should never tell a lie, dreaming big, and how cheaters never win. 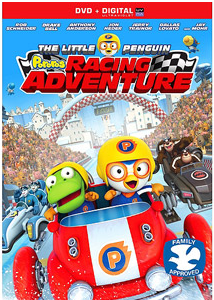 Overall, I have to say that we loved "The Little Penguin: Pororos Racing Adventure" DVD, and can't wait for more DVDs to release from this hit animated series. But, in the meantime, the girls will continue to ask to watch this DVD, as was as tune in to Hulu Plus to see other fun-filled episodes featuring the little penguin, Pororo and his friends. This looks perfect for kids to see during the Olympics thanks for sharing this super cute review.